As a child, Mowgli (Neel Sethi) was found alone in the jungle. Knowing Mowgli had no hope of survival, a panther named Bagheera (Ben Kingsley) takes him to be raised by a pack of wolves. As he grows older, Mowgli becomes one of the pack. One day, Shere Khan (Idris Elba), a tiger, comes to a watering hole where all the animals are gathered. Shere Khan smells Mowgli. Having been burned by man, he warns the animals of what Mowgli will become and demands that the man cub be turned over to him. Knowing Shere Khan’s plans for Mowgli, Bagheera plans to take him back to the man village, so he can live with his own kind. Mowgli does not want to leave the jungle. It is his home. 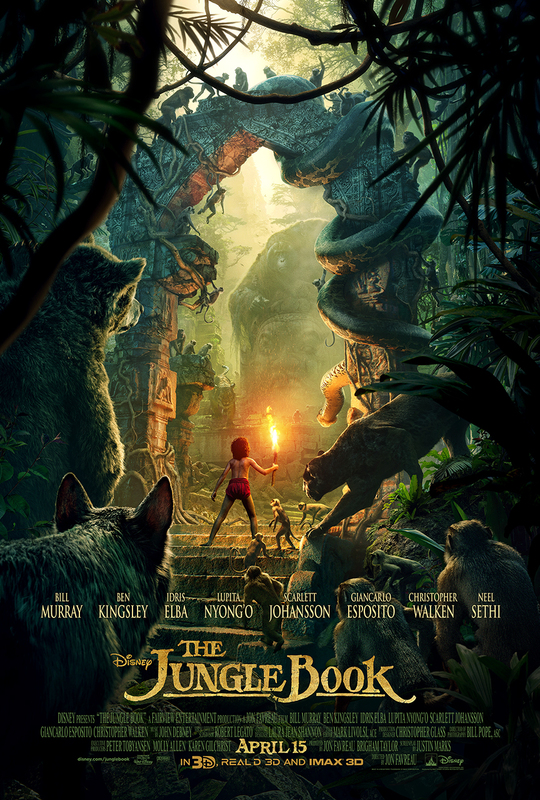 Befriending a bear, Baloo (Bill Murray), Mowgli tries to find a way to survive in the jungle. As long as Shere Khan remains in the jungle, he has little hope of staying alive. To be honest, I was concerned when Disney announced they were working on a live-action version of their animated classic. I wasn’t sure they could pull it off. I should have remembered, this is Disney. If anyone can make it work, they can. The casting for the movie is spot on. Ben Kingsley as the wise, caring Bagheera. Idris Elba as Shere Khan, haunting, ruthless, and bent on revenge. Lupita Nyong’o as Raksha, Mowgli’s wolf mother. Scarlett Johansson as the hypnotizing Kaa. Bill Murray as the lazy, easy-going Baloo. Christopher Walken as King Louie. Each actor’s personality is perfect for their character. The story is a familiar one. Most of us grew up watching Mowgli and Baloo traipse through the jungle as a cartoon. There is little new in this version. I think it is this familiarity with the story that helps the film work. Where the magic happens is Disney doing what they do best. The jungle, the backdrop of the film, is beautifully presented. I don’t know how much of the film was shot on location or how much was computer-generated. It is very well done. My biggest concern was how they would handle the talking animals. I’ve seen too many movies with talking animals that look ridiculous. Disney found a way to make it look good. At no point does it become distracting. It comes across as fluid and natural as the animated version. Credit must be given to newcomer Neel Sethi for pulling off interacting with a cast composed entirely of CGI costars so naturally and believably. The Jungle Book is so well-crafted that it is hard to find anything bad to say about the film. It is definitely worth seeing. A word of caution, however. Due to the nature of the story and the way Disney approached it, it is not meant for young children. If you’re expecting a light-hearted, fun film, like the animated version, you will be in for a bit of a surprise. It is a little intense for younger viewers. Those 8-10 or older will likely be fine, but any younger than that, and you may be up all night dealing with the aftermath. Otherwise, head to the theater, drop the extra money for the 3D screening, and enjoy the movie.